This is not the look of a happy mama bear. If you're someone who's hopelessly addicted to social media like me, you've probably seen the video of the bear cub trying to climb up the snowy mountain. It's like something from a Pixar movie. A mama bear stands at the top of the cliff encouraging her cub to climb up and join her. The cub fails, time and time again. But just like all the classic stories, the cub doesn't give up. Against all odds, the cub finally makes it to the top of the mountain. I am sorry to report that, in fact, the real story is much closer to a horror movie. And it's one that once again highlights mankind's disregard for the world around us. 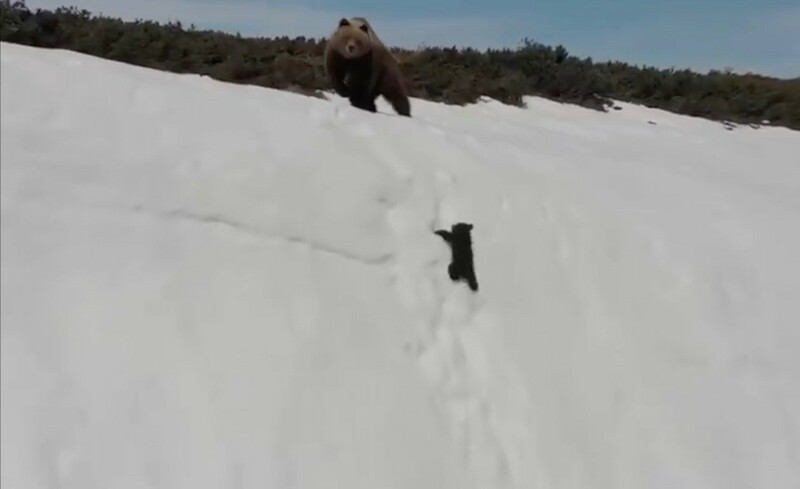 "I am seeing a pretty agitated mama bear who's clearly taking a very young cub across a very steep slope to get away from the drone," says Sophie Gilbert, an assistant professor of wildlife ecology at the University of Idaho. Gilbert was sent the clip by Clayton Lamb, a PhD candidate at the University of Alberta who studies bears. They immediately saw the same problem with the video. Yes, the bears would not give up climbing up the cliff. But this is because of the underlying fact that a drone was harassing them. Typically, Lamb tells the Inlander, a mama bear won't take a cub to a slippery cliff. "I find it very strange that a female with a young cub would be in that general location," Lamb says. "It's outside of the range of habitat they would tread into." And then there's the moment starting at about 1:15 in the video above. The cub is just about to make it to the top when the mama bear stares directly at the camera. The drone quickly zooms in, and the mama bear swipes at the cub, sending the cub cascading back down the mountain. That's the "damning" piece of evidence that the drone is causing a problem, Lamb says. "That put that cub in quite a bit of a risk," Lamb says. "That, I think, is directly because of the drone." The mama bear likely couldn't understand that doing so would send the cub tumbling down the cliff. All it was thinking in that moment, Lamb says, was that she needed to get the cub away from the immediate threat of the drone. "She'll do whatever it takes to keep that cub safe." This kind of thing is all too common among operators of drones, Gilbert says. This particular video was captured in Russia. But it's an issue worldwide, with regulators struggling to deal with a burgeoning drone industry. There's an upside and a downside to drones, Gilbert says. "The upside of tools like drones and phones and all these things is that it does allow people to get excited about wildlife and feel connected in a way that helps them want to conserve wildlife," she says. Shows like Planet Earth that tell the stories of wildlife in close detail can go a long way. But those are professionals who know how to get a great shot without distressing the animals. With amateur drone operators, that's not always the case. "The dark side is people want to connect a little too much, and they forget about the animal in this situation," Gilbert says. Gilbert herself uses drones as a research tool. She also helps capture and tag animals from helicopters. But they have strict rules. For instance, she can't chase an animal for more than two minutes. If it's any longer, animals like elk or deer build up so much lactic acid that they can actually die within a couple days of the chase, she says. Drone cameras usually don't capture that part. Gilbert points to video after video of drones harassing or chasing wildlife. She calls for better regulation of drone behavior. Specifically, there should be better identification of key habitat areas where animals should not be disturbed by drones. Geofencing, or putting up a virtual perimeter that triggers a response when a drone enters the area to keep them out, are already used at airports, and Gilbert argues that can be a tool in certain habitat areas as well. "I think that's one huge and easy step forward that we could take," she says. More research needs to be done on the best practices for drone behavior. For instance, even though it's obvious the drone came too close to the bears climbing the mountain, it's unclear what a proper distance would be. What is clear is that people need to be more educated about drone behavior. Guidelines are available online, both here and here. Essentially, drone users need to make sure they're complying with all aviation rules and try to minimize disruption to wildlife as much as possible. Gilbert says it's frustrating that videos like this can get millions of views that are worth thousands of dollars because it's an incentive for people to keep chasing animals with drones. But if it helps educate people on proper drone use with wildlife, maybe some good can come from it, she says. "I think it depends on what kind of attention is paid to it," Gilbert says. "It took a little while for people to start calling out what was actually happening in this video."